Have the Best Breakfast Ever! Billy Gail’s Café is a beautiful restaurant that serves one of the best breakfast treats that you can enjoy only in Branson. This amazing dining place is a former gas station and log cabin that was converted into a nice café about 20 years ago into this popular tourist spot in Branson. While most of the upscale restaurants, attractions and entertainment venues are on bustling 76 Strip, Billy Gail’s Café is a bit hidden in Route 265. But the locals are familiar with this place and it is voted annually as the best café serving the best breakfast in the region. Set in various rooms of an old cabin that look like antique store, Billy Gail’s resembles a country eatery in a flea market where many of its furnishings are on sale. This great dining spot is decorated with antiques, rocking chairs, houses, tchotchkes and the like, while ceiling fans spin overhead. Coffee in this restaurant is served in mismatched novelty cups, the wood floors are still intact, the tables are covered with red checkered cloths, and the whole thing has the feel of eating in a general store with the ambiance that can only be experienced here. The old gas pumps can still be seen outside, and still painted with hippie-style flowers and smiley faces. The servers who have the characteristics of the Southern charm, may call you “hon,” and accept only cash for payment, and no website. This great place is only open for breakfast and lunch, and is a far cry from the great number of chain restaurants and fast food outlets in the heart of Branson. This great café located in a secluded place is famously known to serve enormous fourteen-inch-across “hubcap pancakes,” which occupy all sides of the plate. All the food served in this amazing café could be fairly be described as hearty and healthy. The pancakes are actually lighter than the look, doughy, thin, and almost crepe-like, with a consistent flavor and coloring. These are usually served with assorted extras offered within like peanut butter, blueberries, chocolate chips, pecans, and all kinds of sumptuous delicacies in generous quantities. Although it may look unusual, bacon is offered here as a pancake addition, and they don’t skimp, with a mix of smaller chunks and sections of strips two inches long. Billy Gail’s Café features an interesting signature dish called “French cake,” which is a combination of pancake and French toast, with Billy Gail’s standard pancake, dipping it in egg batter, and cooking it on the griddle. This cake is not as crispy as regular French toast, but rather tastes more like a typical batter pancake, heavier, a bit thicker and less fluffy. This can contain toppings of your choice and offer a very good regular French toast, using thick-cut Texas toast. 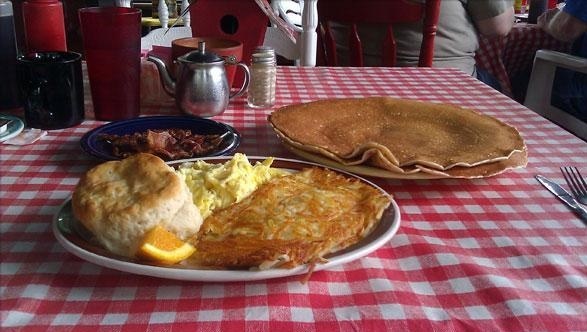 If you want to experience eating in a rare dining place that serves the best breakfast treat with the biggest pancake you’ll ever see, visit Billy Gail’s Café in Branson.